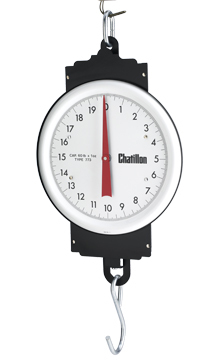 The Warehouse Series mechanical hanging scales are designed for general purpose applications. The scales are constructed of heavy gauge japanned steel with large, easy-to-read 8-inch dial, that have large, bold black numbers and graduations. The scales feature a convenient zero adjustment screw. The scale is factory calibrated using certified NIST weights and comes with top loop and bottom hook.